Giant Hogweed (Heracleum mantegazzianum) is an invasive plant from Asia and was likely introduced into the United States due to its use as a spice in foreign dishes. 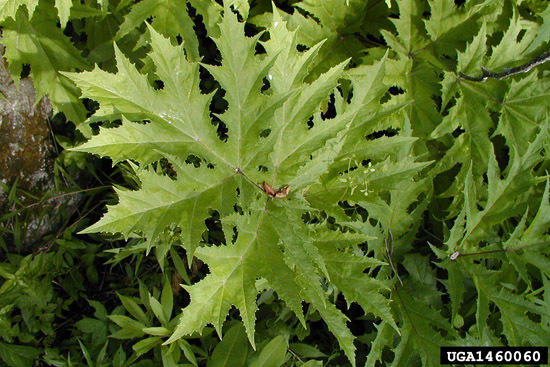 This exotic, invasive has been identified in a couple of Illinois counties. This plant can grow to heights of 10 to 15 ft and a width of 5 ft. It is a biennial or short lived perennial that has a mostly green hollow stem with reddish purple raised spots along with coarse short hairs on the stalk. The stem can grow to 2 to 4 inches in diameter. The plant has small white flowers in flat umbels that bloom in mid-May through July. The seeds are elliptical shaped and one plant can produce up to 20,000 seeds. After seeding, the plant dies back to the taproot which can live throughout the winter. 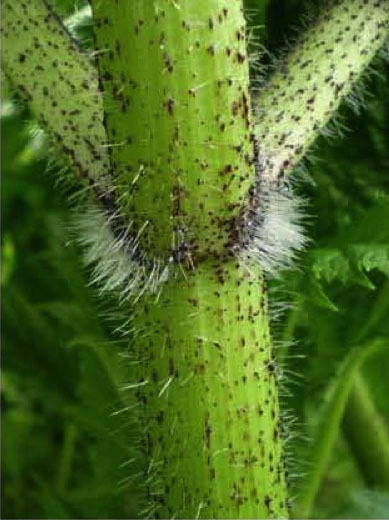 In addition to being an invasive weed that can quickly overtake an area by crowding out other plants, giant Hogweed is also harmful to humans by creating a clear watery sap that can cause burning and blistering on the skin when combined with sunlight and can also cause blindness. This sap can get onto someone just by brushing by the leaves or breaking the stem or leaves. It is highly recommended that when dealing with this plant one should wear gloves and protective clothing to allow no contact with skin. Giant Hogweed belongs in the carrot or parsley family (Apiaceae). It has several look-a-likes (http://www.hort.uconn.edu/cipwg/hogweedLookalikes/HogweedLookAlike_WEB/index.htm) including cow parsnip (Heracleum lanatum), angelica (Angelica atropurpurea), and poison hemlock (Conium maculatum) - all common plants in Illinois and all commonly mistaken for giant hogweed. 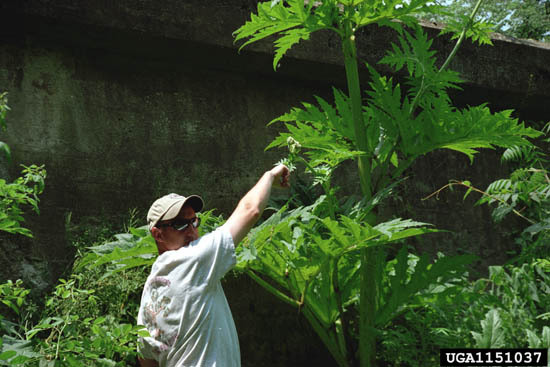 Although many of these plants may look like giant hogweed at first glance, none of them get to be as large or have its exaggerated characteristics. 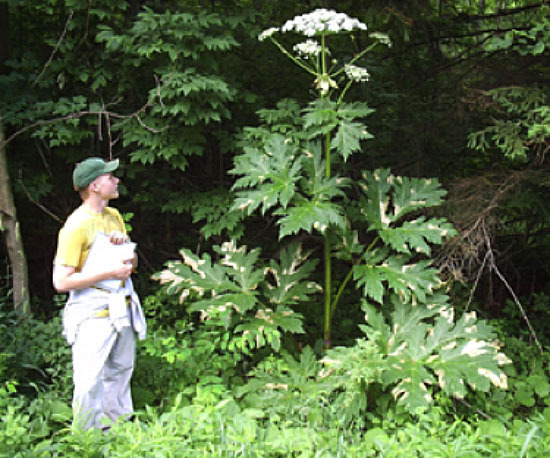 Giant hogweed is still rare in Illinois.